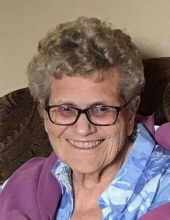 Margaret Ann Benes, age 87, died on February 3, 2019 at Valle Vista Manor in Lewistown, MT of natural causes. She was born on July 5, 1931 to Nick and Anna (Kiska) Spiroff on the family homestead east of Roy, MT. Margaret joined her older brothers, Nick and Joe, and older sisters, Mary and Katy, before becoming an older sister to her brother, Ray. Margaret attended the elementary grades in the one room Kachia and Valley View Schools. Margaret had to walk for miles, board with the teacher or "batch" in Roy with her brother Ray to attend school. Margaret graduated from Roy High School and married Don Harvey in 1949. Margaret and Don farmed and ranched east of Roy. They had three children while living on this farm: Danny, Rose and Connie. 1982, Margaret continued to live in Denton. She was active in the Denton Methodist Church, church circles, town council and community affairs. Margaret also became a member of the United Methodist Church in Lewistown. In 1991, Margaret married William "Jay" Benes and moved to the farm/ranch at Christina, MT. March 2018, they moved into the Villa Assisted Living in Lewistown. Jay died in June 2018. Helena, MT; sisters-in-law: Katie Spiroff of Helena, MT and Donna Michel of Billings, MT; brother-in-law: Robert Benes of Lewistown, MT; numerous nieces and nephews and other extended family members. Visitation will be at the Creel Funeral Home Chapel in Lewistown on Friday, February 8th, from 5:00 to 7:00 p.m. A Celebration of Margaret’s life will be held Saturday, February 9th, 11:00 a.m. at the Funeral Home. Interment will follow at the Lewistown City Cemetery. Memorial donations can be made to either the Denton or Lewistown United Methodist Church. To send flowers or a remembrance gift to the family of Margaret Ann Benes, please visit our Tribute Store. "Email Address" would like to share the life celebration of Margaret Ann Benes. Click on the "link" to go to share a favorite memory or leave a condolence message for the family.